With the holiday season upon us, the cold air is filled with the promise of gifts, strained family dinners, and plenty of travel. As great as travel is, it can come with an undue amount of stress, anxiety, and discomfort, which is where some CBD could come in handy. However, traveling with CBD can come with its own complications and headaches, so here are some tips for traveling with CBD products. Can You Drive with CBD? If you are driving, going by bus or train, or otherwise traveling by land, you should be fine traveling with CBD as long as you stay within state lines. When you cross the border, things can get tricky. For one, states have different laws for cannabis and CBD products. While it might be completely legal in your home state, CBD oil is only legal in, say, Wyoming if the oil contains less than 0.3 percent THC or if you own a registration card. The TSA states, “Possession of marijuana and cannabis-infused products, such as Cannabidiol (CBD) oil, is illegal under federal law. TSA officers are required to report any suspected violations of law, including possession of marijuana and cannabis-infused products.” Furthermore, although the TSA does not actively search for cannabis or other drugs, a TSA agent is obligated by law to inform local law enforcement if they do find CBD oil or other cannabis products on your person during screening. From there, it really depends on the airport. If you aren’t actually breaking any state laws, the police will let you go (though you may be asked to dispose of your CBD before you go through security). If cannabis isn’t legal in the state, you could be prosecuted. If you’re flying internationally, things get even more serious. Many countries, including Japan and the United Arab Emirates, have zero tolerance policies for cannabis possession. That means that even the smallest amount of CBD could result in jail time in that country. If you need CBD for your plane ride, we recommend taking your CBD before you get through security. Assuming your plane doesn’t experience any long delays, this means that your CBD will hit as soon as your plane is in the air, giving you the calm and peace you need to get through a flight. If you need CBD while you are away from home, do your research beforehand. Look into the state and local laws. Know what documentation you may need from your doctor. If you’re traveling to a state that allows use of medical marijuana, look up the dispensaries where you may be able to get your CBD while you’re enjoying your vacation. If you already have high quality CBD products, mail them to your destination beforehand. Traveling with CBD or any cannabis product is risky, and it’s almost always better to buy your CBD at your destination. If you are traveling within state lines or otherwise know that you are okay traveling with your CBD products, keep these tips in mind to ensure smooth travels. Choose the right product – Go for a travel-friendly spray or tonic over something larger and bulkier. Remember that any liquid, even CBD oils, must be in containers smaller than 3.4 ounces. Vapes and e-cigarettes are allowed, but they cannot be checked and must be in your carry-on bag. Always bring any required documentation – If you need your CBD oil for any specific medical purpose, make sure you bring the proper documentation, whether it’s the prescription or a note from your doctor. Handle CBD with care – With CBD in your carry-on, take some care when handling your bag. Don’t toss your bag around or drop it on the floor. Always keep in mind that you have your CBD in the bag. 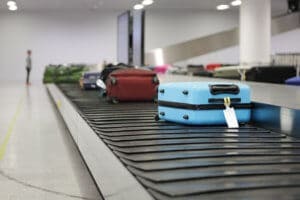 If you’re worried about your CBD product getting squished or broken by other luggage in the overhead, keep the product in your smaller bag or in your pocket. Otherwise, make sure that your CBD is packed securely with some clothes to pad any impact. Above all, tightly secure the lid to any CBD oils, tinctures, or other liquids. You do not want to unpack your bag to find your CBD spilled all over your other toiletries. Keep your CBD cool, dry, and dark – If you’re traveling on the road, make sure you store your CBD in a cool, dark, dry place to ensure the highest quality when you reach your destination. Leaving your CBD oil or edibles in a hot car can harm the ingredients. Assuming that you take the right precautions with your CBD, you generally shouldn’t have any problems. Safe travels!